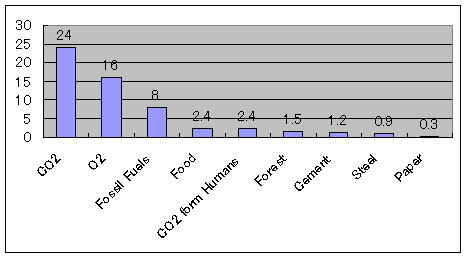 Human being emit 24 G ton CO2 by burning 8 Giga ton of fossil fuels such as coal, oil, and gas, combining 16 Giga ton oxygen in the air. NASA space studies measured that a man emits one kg CO2 every day by breathing. This number suggests that 6.8 Giga human population emits 2.4 Giga ton CO2 on the planet earth by breathing a year. This means a human has 10 slaves of CO2 equivalent. This is global average. A US citizen has 55 slaves, and a Japanese has 25 slaves to live convenient life. Liquid Crystal Display became bigger than those used for digital watch and pocket calculator in late 1980s. 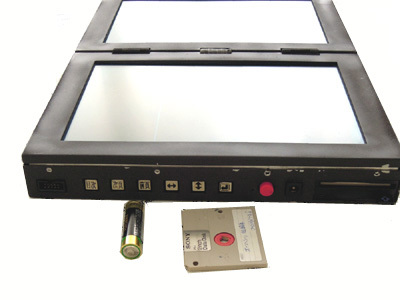 We thought that the electronic tool for reading book is possible, if we use such bigger Liquid Crystal Display. We felt that the time to read the display is 80% or more of the time for using computers. It is apparently longer than the time to input characters by hitting key board. We thought if we can develop electronic book, it is energy efficient and good for saving paper resources. This is the first electronic book we developed in 1989. We used two Liquid Crystal Displays, and tried to develop book reading devices similar to ordinary books. We prepared text files using PC from news paper and novels. The text files are stored in 2 inch Floppy disk which is developed by SONY for Word Processing Machines. SONY floppy disk was the smallest one in 1989. 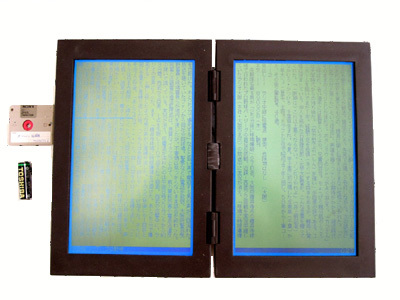 The electronic book NO.1 can read text files from SONY Floppy disk, when it is turn on. And it displays the content lists. You can select the article and jump into the respective pages. And you can use the keys of “ Next Page “or “ Previous Page “ to read the contents. We had a US patent of Electronic Book (US patent Number 5,239,665) in 1993. But we abandoned it in late 1990s. Side view: Five keys and Power SW(red)、Insert Gate of Floppy Disk is in the right side. Copyright(C) 2013 Research Institute for Systems Technology All Rights Reserved.